Trentino-Alto Adige, also known as South Tyrol, boasts some of the most famous ski resorts, and features excellent food and wine. 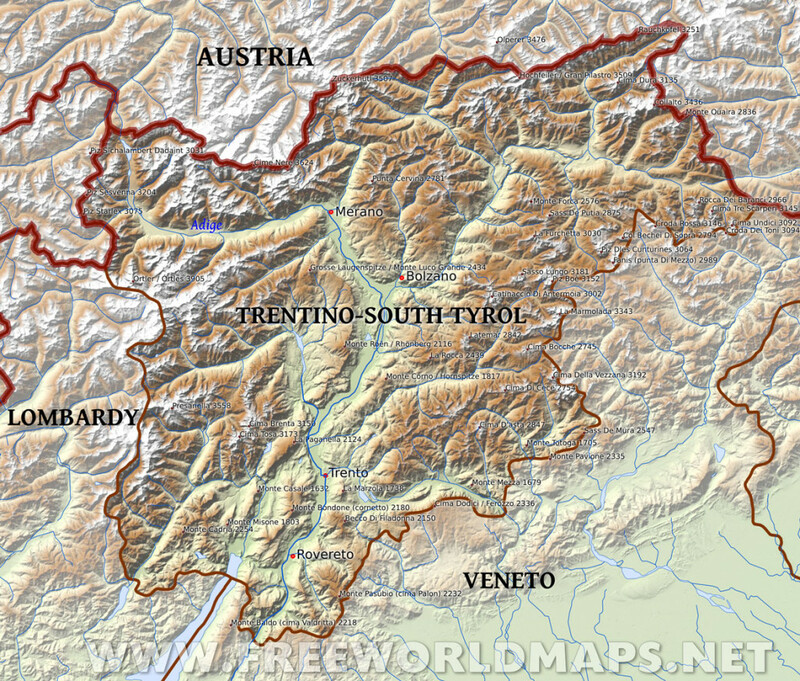 Trentino-Alto Adige is something of an anomaly: a mixed German-Italian region, much of which has only been part of Italy since 1919. Before then Alto Adige was known as the South Tyrol and was part of Austria. At the end of World War I, Austria ceded South Tyrol to the Italians, and, in a bid to make the new territory instantly Italian, Mussolini turned the name on its head, naming it after the upper reaches of the Adige River, which bisects the region. Many Tyroleans opted for resettlement in Germany, but others stayed and have clung tenaciously to their language, culture and traditions. Even now, one of the first things you’ll notice about Alto Adige is its German character. Gothic onion-domed churches dot the landscape of vineyards and forests, street signs are in German, and there’s sauerkraut and strudel on the menu. By contrast Trentino, just to the south, is 98 percent Italian-speaking, and the food and architecture belong more to the Mediterranean world than to the Alps. Both parts of the region enjoy semi-autonomy from central government, along with one of the highest standards of living in Italy, a consequence of special grants and aid they receive from Rome – intended to defuse the ethnic tension that has existed ever since enforced union took place. If some German speakers are unwilling to remain part of Italy, there are right-wing Italian speakers who would be equally pleased to see them go. Friction between the two camps flared up in the Sixties, when Germanic activists staged disturbances. Talks between the Austrian and Italian governments brought about a package of concessions and promises from central government, known as the pacchetto, all the provisions of which have now been implemented. These days, the political climate has shifted slightly: in the 1993 general elections, the fascist MSI (Movimento Sociale Italiano), once the most popular party among Italian-speakers, lost votes; and German-speakers moved away from the extreme nationalist Union Fur Sudtirol towards the Northern League and the Greens. Tourism, farming and wine production are the mainstays of the economy, and there are plenty of good, reasonably cheap guesthouses and agriturism places in the mountains and vineyards. Although the region’s resorts can be lethargic, the landscape, dominated by the stark and jagged Dolomites, is among the most beautiful in the country. Circling the spiked towers of rock that characterize the range, a network of trails follows the ridges, varying in length from a day’s walk to a two-week trek; the long-distance trails, called alte vie, can be picked up from the small resorts. The chief towns of Trento and Bolzano are the transport hubs for the region. Trento gives access to most of the western Dolomites: the Pale di San Martino, a cluster of enormous peaks encircling the high, rocky plain above San Martino di Castrozza; the Catinaccio (or Rosengarten) range between the Val di Fassa and Bolzano; the Gruppo di Sella, with its vie ferrate ; and the glacier-topped Marmolada. Still in the western Dolomites, but with easier access from Bolzano, are the Alpe di Siusi, a magical plateau of grass and wetland, high above the valley. The alpe are enclosed by the peaks of Sasso Lungo (or Langkofel) and Sciliar (or Schlern); to the north is the quieter Odle (or Geisler Gruppe). Even further to the west, on the other side of Trento, are the Dolomiti di Brenta, a collection of wild peaks above the meadows of Valle Rendena. The eastern Dolomites start on the opposite side of the Adige Valley, past Passo di Campolongo and Corvara, with activity focusing on Cortina d’Ampezzo, self-styled “Queen of the Dolomite resorts” – though actually just across the regional border in the Veneto. In summer, avoid the overpopulated peaks like the Tre Cime di Lavaredo and head for Sorapiss or Monte Pelmo to the south, or Le Tofane and the mountains of the Fánes-Sénnes-Bráies group to the west. In winter, Cortina comes into its own as an upmarket ski resort with excellent, if expensive, facilities. Trentino and the South Tyrol (Alto Adige) in the north of Italy are high alpine regions of extraordinary beauty, perfect for trekking, skiing and enjoying the outdoors, with beautiful alpine towns and villages to explore, full of history and interest. Long a part of the Austro-Hungarian empire, the meeting of cultures in this part of Italy is fascinating. This book is an excerpt from the forthcoming update of Blue Guide Northern Italy.